Providing asset maintenance management software for over 22 years in 42 countries worldwide. Designed by a maintenance manager for maintenance managers! Founded in 1998 near the Silicon Valley in California. One of the initial founders had many years experience in asset maintenance management and software engineering. MaintSmart CMMS software quickly because popular both domestically and internationally. The software’s international popularity spiked in 2000 with the release the translatable version of MaintSmart. Approximately 40 countries outside the USA currently successfully use MaintSmart. One notable example is Iraq’s Ministry of Electricity and their use of the CMMS to manage the critical equipment at 40 gas-powered electrical turbine power plants. We released the web-based version of MaintSmart in 2002. Hospitals, colleges and hospitality maintenance operations or really anywhere that there may be many potential work requesters benefit from the web-based CMMS module system. In 2015 MaintSmart Cloud became available. This is the full enterprise system with extended support for one monthly fee. The cloud version of MaintSmart does not require extra hardware, IT personnel or system maintenance. The entire CMMS system resides on a secure encrypted triple redundant offsite hosted server. Our latest major version upgrade, MaintSmart 5.0, has many user-requested upgrades, a powerful upgrade to the already useful dashboard and many other time and money saving features. MaintSmart: a reliable, stable company. Guiding maintenance managers for 21Years and counting...we'll be here when you need us! Our basic (complete) software package comes with work orders, preventive maintenance, equipment downtime tracking, inventory management and a complete purchasing system. Additionally, our CMMS solution comes with a perpetual software license. There are no extra fees, subscription costs or any other required cost. Users have commented that they like MaintSmart for many reasons with analysis and reporting being one of their primary reasons for choosing this asset maintenance management (CMMS) system. Specifically, this software exports data directly to MS Excel, MS Word, Adobe Acrobat and many other useful formats. Additionally, a complete drag and drop report builder enables the user to build reports with graphs from any data in the entire program. 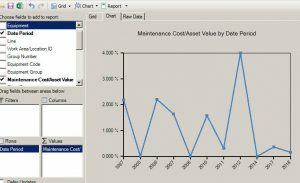 If this is not enough, MaintSmart leverages Crystal Reports, a powerful data reporting system, for many other filterable reports throughout the software. Another favored characteristic is the fact that our CMMS is implemented very quickly. A typical 200 equipment item maintenance operation can be completely set up with a work order and preventative maintenance system in approximately 24 hours by one person. The reason for this is that many parts of the CMMS have duplicating and other shortcuts for speeding the configuration process. In the case where data is already available (such as equipment spares) our technical team may perform a data import for the maintenance manager or inventory clerk. Unfortunately, many of our competitors have gone out of business over the years. This is even more unfortunate for the businesses using the unsupported CMMS software from these now defunct software companies. Over the past 21 years approximately 50-75 CMMS software companies go out of business annually and approximately 50-75 new CMMS software companies replace these year after year. There's a reason why MaintSmart is still going strong after 21 years. Our asset maintenance management solution is here to stay! We believe in corporate responsibility and take this matter very seriously. Software training is available either online, offsite or onsite. We are located in the Pacific Northwest near the ocean in southwestern Oregon. The North Bend Airport (OTH) is across the street from our office. Flights from Denver, Colorado, Eugene, OR and San Francisco, CA are available various times of the year. Our corporate office is approximately 100 miles from Eugene, Oregon.